In a report focused on the losses due to returns, IHL Group estimated that worldwide, retailers lose more than $600 billion each year to sales returns. Labeled the "ghost economy" by IHL, retailers in North America accounted for $183 billion of that number alone. Why the high rate of return? Well, according to the study, wrong size was the number one reason. This could be from a sweater that did not fit to a TV that did not fit in the space. And while we can attribute some of this loss to "customer friendly" return policies, I believe the vast majority of it comes from poor service during the sale. On one side, it is the retailer's fault. 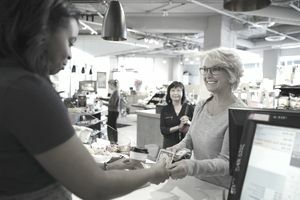 In a recent article titled "Customer Service Does Not Mean Self Service," I explored the trend in retail to create self-service processes in the stores under the guise of good service. This alarming trend only creates returns since the likelihood someone will make a poor buying decision is directly proportional to the level of customer service they receive when they buy. But the bigger issue is poor salesmanship in the first place. Retail has become an industry of clerks who simply point you in a direction and take your money. It is rare when we encounter a true sales professional these days. You know what I am talking about—that person who listens to your wants and needs and then helps you make a wise buying decision. When I had my retail stores, a return was rare. And we had a very liberal return policy. I even gave exchanges on merchandise that was not purchased from my store or on items I didn't even carry in my store all to build the reputation for the best service experience in the market. So, with such a liberal policy, you would think that our returns would be very high. But they were not. The reason was simple; we had sales professionals and not retail clerks. Our staff was trained to research the customer's wants, interests, needs, concerns and desires before they ever showed them a product in the store. We invested the time on the front end of the sale to make sure we were only experimenting with merchandise that had a high likelihood to close—and we knew that because of the questions we asked the customer on the front end of the sale. And, since we took the time to match the customer with the perfect product, the "wrong size" issues just never happened for us. Sure, there were times when people got home and changed their minds. We had the occasional "what was he thinking" return by a wife of her husband's purchase. But, thankfully, this was a rare occurrence. The moral of the story is this—use sales professionals who sell and not retail clerks who..well..clerk. If you provide an exceptional service experience, then the customer will respond with his or her loyalty. And part of loyalty is not taking advantage of your liberal return policy. Take the time to work with every customer. Don't show the customer how the product works, let them experience it by placing the remote in their hands or letting them try on the shorts. In apparel especially, never let someone get out of the store with a sack full of clothes without trying them on first. That is just inviting returns. Essentially, that customer is using the "dressing room" in her home then bringing back what they do not like. Returns cost us billions not only in lost revenue but also the cost of payroll to handle the return and then the cost of employees to clean up, restock, etc.—costs we often forget to calculate in the equation. If you provide excellent sales service when they buy, then you can dramatically reduce your returns by making sure they buy what they want and need versus what they might like to try. And remember, always lock in the sale after they buy to ensure it stays sold.